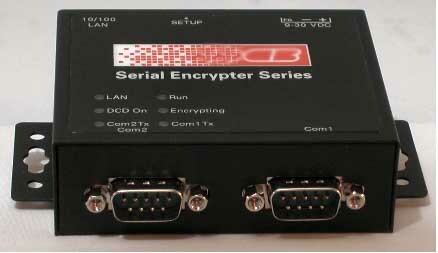 The SSE-R is an industrial rated serial data encryption device featuring two serial ports; Com1 is clear text, Com2 is the encrypted data link. The SSE-R uses AES 256 bit encryption, 128-bit block size. AES encryption is the US Government standard. The SSE-R is designed for use in serial applications where normal block encryption devices may not work, yet AES encryption is required. A fixed key design and self-synchronizing cipher eliminates the need for negotiation between the SSE devices and allows for data encryption over unidirectional connections. The SSE-R provides encryption of data between serial host and remote user sites. The two RS232 serial ports operate at asynchronous speeds as low as 300 bps and as high as 57.6 Kbps. The SSE-R serial interfaces can be configured as RS232, or RS422/RS485 4-wire. The SSE-R may be used point-to-point, linking two separate remote sites with radios, leased lines or dial connections, one port used for the connection, the other port for the user equipment. The SSE-R can also be used on point-to-multipoint links, such as SCADA polling applications. The SSR-R can be used in unidirectional broadcast applications, both point-to-point or point-to-multipoint. The SSE-R is especially attractive for use over multipoint radios where data privacy is desired. The SSE-R is straight-forward, easy to configure and maintain. Units may be configured via a serial port, or using the Ethernet port, via telnet or a web browser. The SSE-R is feature rich but simple to set up and operate.